The Controller. It's a DualShock 4. Plenty of info here. Additional DS4 controllers will be available at launch for $59 / ¤59 / £54, and will also come in colors of Magna Red and Wave Blue. The Package. There will be one DualShock 4 controller and one wired earbud headset (mono ) included. The new PS Eye will not be included and is not required to use the console. Release Date. November 15th for NA, November 29th for EU. No specifics on release dates in other territories yet. Trophies. There Will Be Trophies. They will be part of your current PSN account that has PS3 and Vita trophies. Trophy Auto-Sync. We don't know if the PS4 will auto-sync your trophies upon earning them. User Interface. The XMB will be replaced with the PDM (PlayStation Dynamic Menu). This menu is customizable. There's not a whole lot of info on the specifics of this yet, so stay tuned. System Specs. IGN has put together a nice comparison of the PS4, XBox One and Wii U specs and you can also find info on all 8th generation consoles on Wikipedia. 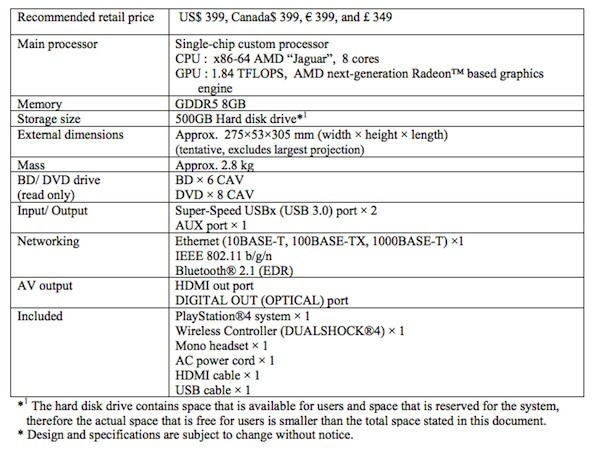 For a quick comparison between the PS3 and PS4 specs, see AlphaCookie's post here. For an in-depth discussion on how the PS4 was created, check out this Gamasutra interview with the Lead Architect, Mark Cerny. RAM. Based on reports, it seems that around 4.5GB - 5GB (of the full 8GB) are available to developers for game usage. Regardless of the specific number, this is a marked improvement over the 256MB RAM / 256MB VRAM that the PS3 makes available. HDD. It's 500 GB. You can upgrade it just like you can for the PS3. Peripheral Compatibility. You will be able to use PS3 Move controllers on the PS4. It will use the new PS Eye, which can be purchased separately for $59 / ¤49 / £44. The new PS Eye will connect to the console with a proprietary connector, not with USB. PS3 wireless headsets will work with the PS4. Internet Connection. You do not need an "always on" persistent internet connection to use the console or play games. You do not need to "check in" every 24 hours. You can play games offline whenever you like. You will need PS+ to play online with PS4. One account on each console can activate online play for all sub-accounts on that same console. F2P games will not require PS+ to play online. DRM. Sony first-party games will not implement any type of DRM. There will no Online Pass Program for PS4. However, third-party publishers can still choose to implement DRM in some way. What form this might take, we are not sure. Backwards Compatibility. The PS4 will not be backwards compatible with games made for previous consoles at launch. This includes both retail and digital copies of games you have purchased on PSN. There are plans for streaming of PS3 titles in 2014, using Gaikai technology. This will most likely be expanded to titles from previous systems in the future. It has also been announced that if you buy a copy of a game on PS3, you will be able to get the digital PS4 version of the same game at a "significant" discount. How this works or what amount of discount you get, we don't know, but this will only be available for specific games. Games. There will be a digital version for every game on PS4. You will also be able to play any game from your digital library by logging into your account on any PS4 system. For info on confirmed PS4 titles in development, see this thread. Region Locking. There will be no region locking. Whether or not this extends to DLC, we don't know. Downloading. You will be able to start playing a game soon after initiating the download. No more waiting for the entire game to download and install first. This is called "Remote Pre-Loading" and is analogous to streaming a movie from Netflix... you don't have to download the entire movie to start watching it. Credit to ps3trophies.org for the above information. PlayStation 4 owners won't be able to play PS3 games at launch, but it won't be a long wait. Sony plans to release a digital library of PlayStation 3 titles powered by its Gaikai streaming technology in North America starting next year. That's according to Sony Worldwide Studios president Shuhei Yoshida, who revealed the news during a roundtable discussion at the Tokyo Game Show. And since all the heavy lifting and processing will take place in the cloud, you'll also be able to play those PS3 classics on a PS Vita and the newly unveiled PS Vita TV. Yoshida says gamers can expect a "decent number" of titles to be available when the feature launches, with selection growing over time — much in the way Sony releases PSone and PlayStation 2 classics now. Sony's PlayStation 4 console doesn't offer traditional backwards compatibility with the PS3 game library. But when the company announced its acquisition of Gaikai last year, gamers immediately began hoping the technology would eventually let them play Uncharted, Heavy Rain, Ratchet and Clank, and other PlayStation hits on the next-gen hardware. To their delight, Sony has now made those plans official. We aren't going to have to buy those games a 2nd time are we? If you buy the PS3 game you can pay $10 to upgrade it to the PS4 version. Or you could just you know buy the PS4 version in the first place and save $10. Eagerly awaiting the return of the big pappi, c-wizzy, chad warden. Or like, play them on your PS3. Or you can delay gratification and save $10. PS4 is out in North America today. Unless they dont sell a PS4 version. 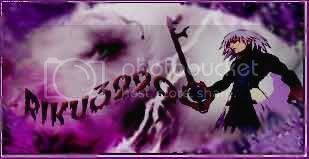 eg, Kingdom Hearts 2.5 HD next year is only on PS3. Either way, there's a good chance they'll find work-arounds for these which is good, compared to the brick wall they made for PS2->PS3 games. I probably wont buy a PS4 until late next year though, still got plenty of games I wanna play on PS3. There isn't much of a reason to get either the PS4 or One this soon. Most of the games that have been hyped for the systems won't even be out until mid-way through 2014. I don't plan on getting the xbox one or ps4, planning to get a wii u when the new super smash bros is out and along with my laptop got every game I really want to play covered. Hate to go pc master race on it but xbox/playstation do very little over a computer, pc ports can be slow but the wii u is the only one where you won't get access at all to the games. Got the system the day it came out and Ghosts as well, aside from the control I haven't seen much difference. Although finding the eject button hungover did prove a problem. Haha. Unless you're like me, who's only realized at the end of the generation that Sony consoles have the games they want and Microsoft consoles don't. 2014 has some huge MMO/RPGs coming. Sony has announced PlayStation Now during its CES 2014 keynote, a streaming service that enables users to play games on a variety of Sony devices, such as Bravia TVs and PS Vita. There's also a cloud-based TV service set to launch on the Sony Entertainment Network, offering on-demand video content. Games available for streaming include The Last of Us and Beyond: Two Souls, meaning you can play titles like these presumably without the need for a PlayStation console. You can even play PSone, PS2 and PS3 games on your PS4, as promised. "This service will in the long term provide existing PlayStation gamers with instant access to the games they love from previous generations, from the original PlayStation, PS2 and PS3," said House. "Equally important, the service will also introduce the world of PlayStation to even non-console owners via smartphones, televisions and other devices." PlayStation Now will also enable users to rent games and there'll be subscription services on offer too. A closed beta is set to commence in North America this month, with PlayStation Now to fully roll out in summer 2014. I was wondering what they'd do with Gaikai. PSNow is pretty cool but it will have very limite uses in the states. There's just so many areas that can't sufficiently stream youtube vids at 144p let alone freaking a videogame at high res. Dat throttling from ISPs and bad infrastructure.